- Decouple the external interface from the implementation better. Perhaps reduce the external interface to a single #include. - Split the code into smaller parts with clearly defined responsibilities. - Reduce internal dependencies in option parser code. access the option parser in the same way. - The separation between a parser and a parse was very non-existent/unclean. is probably still a lot more that can be done. - The option parser design should be documented better. faced with an invalid specification, it should give a clean error message. - issue481: avoid special case for open lists. - issue626: introduce a namespace. Created on 2015-10-31.18:43:36 by malte, last changed by malte. - Make the option parser code planner-independent. still too much work to do. >> Is there interest in working on this further? >> new one with a clean slate? > I don't have a preference either way. the first item to the summary; the second was already included. > it would be to achieve this or if it's worth looking into this. figure out what kind of evaluator it is. The easiest and cleanest way I can think of to make "inheritance within plugins"
could be separated. For example, we could get rid of all the "if dry_mode" tests. a lot of magic that has its own disadvantages. feature request. If we want to work on it, I'd do it outside this issue. would be to achieve this or if it's worth looking into this. > Is there interest in working on this further? > with a clean slate? I don't have a preference either way. I have cleaned up the summary a bit. in improving the option parser codebase. of things in need of improvement. Is there interest in working on this further? Summary: added reference to issue844 and minor cleanup. that were specific to issue842. They have been added to that issue as msg7717. Copy plans for detecting plugin name collisions from issue729. present. Hence, I'm putting it back in, but adding a reference to issue718 there. ScalarEvaluators". This item was resolved with issue718. Testing the tracker after server maintenance. updated summary to show that issue626 is merged. Split off issue626 to introduce a namespace. 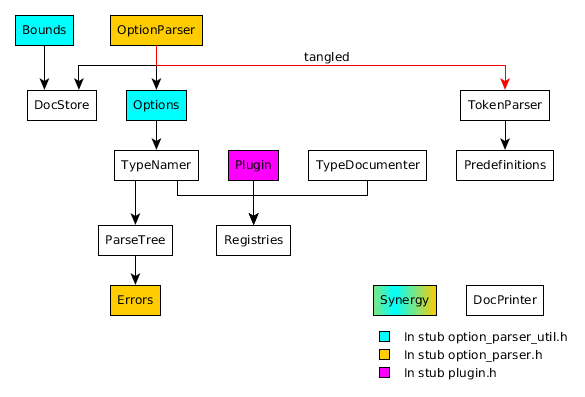 Attached a graph showing the current header dependencies. Made the summary a bit more structured. Updated summary to take into account issue608 is done. Added issue608 for splitting the option parser code into more files. issue606 will move the code to a subdirectory. This is a followup to issue586. ScalarEvaluators from the UI perspective. - Open lists need special-casing because they are templated. This is issue481. --heuristic for Heuristic and --landmarks for LandmarkGraph. - The code should be moved to a directory and use a namespace. that it could be reused in a different project without changes. summary: High-level goals: - Decouple the external interface from the implementation better. Perhaps reduce the external interface to a single #include. - Make the option parser code planner-independent. Some details: - Split the code into smaller parts with clearly defined responsibilities. - Reduce internal dependencies in option parser code. - Avoid special case for Heuristics and ScalarEvaluators. - Avoid special case for plugin types that support predefinition. - Get rid of need to list plugin types manually for get_help_templ. (This should also fix issue619.) - Introduce a namespace. Specific issues: - ~~issue481: avoid special case for open lists.~~ - ~~issue606: move the code to a directory~~ - ~~issue608: split code into more files~~ -> High-level goals: - Decouple the external interface from the implementation better. Perhaps reduce the external interface to a single #include. - Make the option parser code planner-independent. Some details: - Split the code into smaller parts with clearly defined responsibilities. - Reduce internal dependencies in option parser code. - Avoid special case for Heuristics and ScalarEvaluators. - Avoid special case for plugin types that support predefinition. - Get rid of need to list plugin types manually for get_help_templ. (This should also fix issue619.) Specific issues: - ~~issue481: avoid special case for open lists.~~ - ~~issue606: move the code to a directory~~ - ~~issue608: split code into more files~~ - issue626: introduce a namespace. summary: - no longer list plugin types manually for get_help_templ. - avoid special case for Heuristics and ScalarEvaluators. - issue481: avoid special case for open lists. - avoid special case for plugin types that support predefinition. - issue606: move the code to a directory and use a namespace. - decouple the external interface from the implementation better.